South Korea has imposed a temporary nationwide ban on poultry transportation as it struggles to contain an outbreak of the highly pathogenic H5N8 virus, which has led to the slaughter of some 190,000 birds. 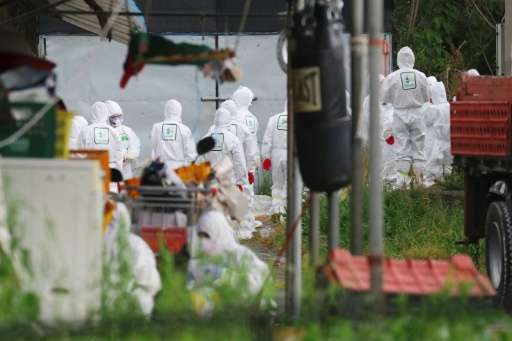 The first case in this outbreak of the virus was confirmed in the southern island of Jeju on June 2, and four more cases have been confirmed in different locations across the country. 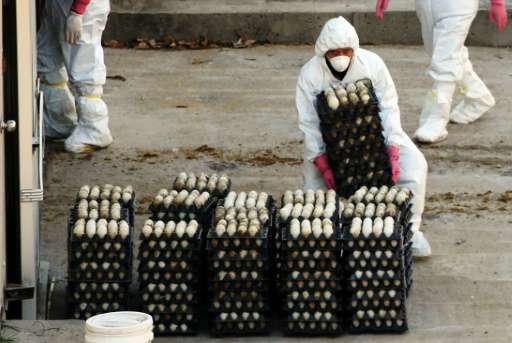 On Tuesday, Seoul raised the national bird flu alert to its highest level, as it ordere more than 180,000 chickens, ducks and other birds be culled, the agriculture ministry said. "We hope that the outbreak will be contained soon with the bird flu alert raised to the top 'grave' level," a ministry official told AFP. "Grave" is the final step on the four-level alert system, and means officials can ban any movements of vehicles carrying birds, shut poultry stores or animal slaughterhouses, vaccinate poultry, and disinfect any vehicles on the road. Under the 24-hour poultry transport ban that took effect Wednesday, all birds—and bird farmers—were banned from travelling, with farms subjected to disinfection. The worst outbreak of another strain—H5N6, the most highly contagious strain of avian flu ever to hit the South—was recorded late last year when a record 30 million birds were slaughtered, which sent egg prices soaring. The World Health Organization warned earlier this year that the strain has caused "severe infection" in humans.